Claire has a long-standing interest in health, anatomy and physiology, having studied biology as her first degree in Reading. 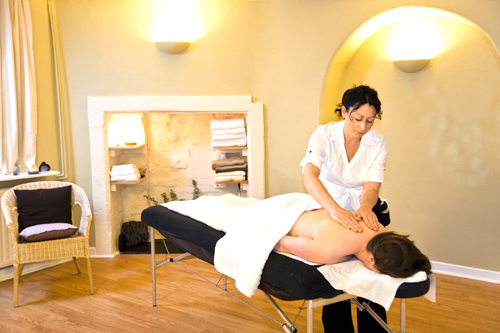 Her interest in complementary medicine then grew and she went on to do an ITEC Holistic Massage Diploma at the Cotswold Academy in Cirencester. Claire then developed a keen interest in acupressure and Chinese Medicine, and travelled to Bangkok to learn General Thai Massage and Thai Foot Massage at the internationally renown Wat Po Medical School. She then obtained an Acupressure Practitioner Diploma from the Acupressure Institute in Berkeley, California. Claire spent a year working at the Clonmel Acupuncture Centre in Co. Tipperary, Ireland, before returning to England to set up her own Acupressure Centre in Bath. Claire and her family have since moved to rural Dorset. Claire continues to further her massage and acupressure knowledge by regularly attending workshops, seminars and training courses. Most recently Claire has increased her massage skills by receiving training on Shoulder Problems, Pregnancy Massage and Chinese Cupping. Claire is a member of the Complementary Therapists Association, and is fully insured.